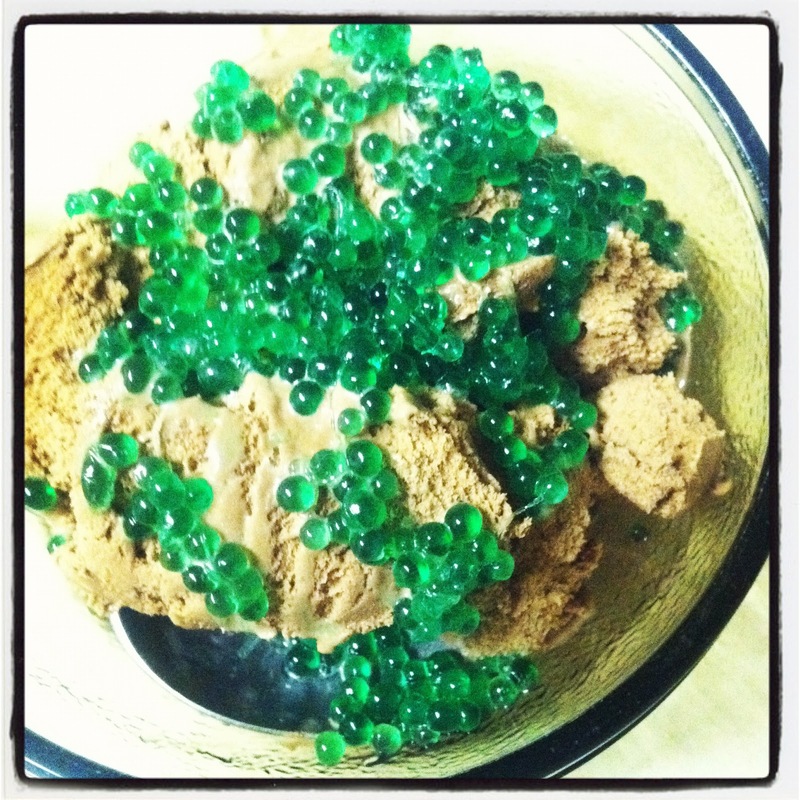 For Day 6, I made Mint Caviar. This stuff looks REALLY REALLY COOL. However, I want to warn you that it is surprisingly not very flavorful. 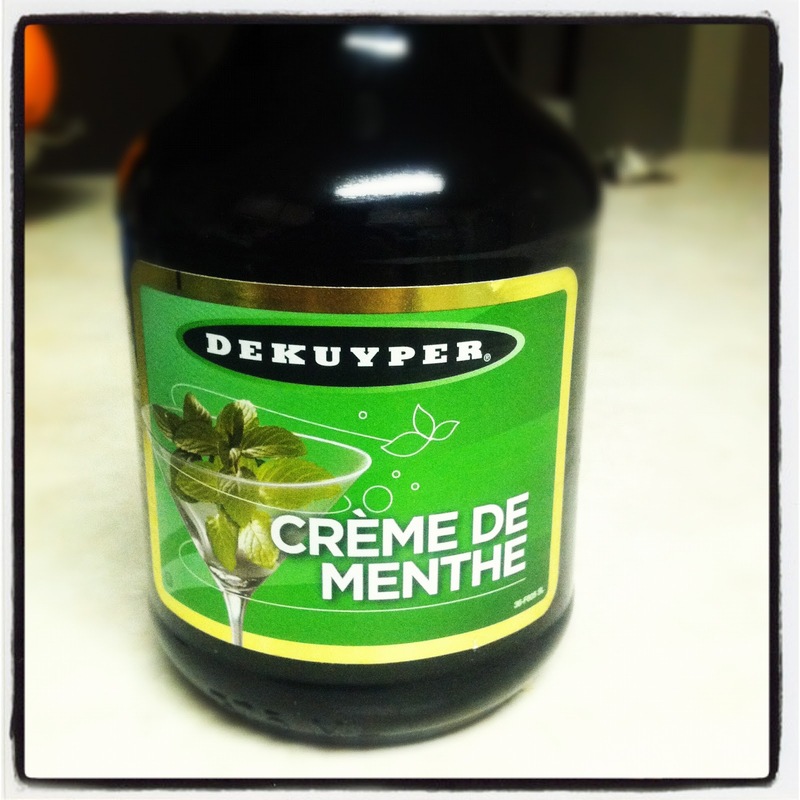 It doesn’t taste bad, but I used creme de menthe and it really didn’t taste minty at all. If you make caviar of any kind, I would make it with the intention of a cool garnishment, but don’t expect it to impart much flavor. 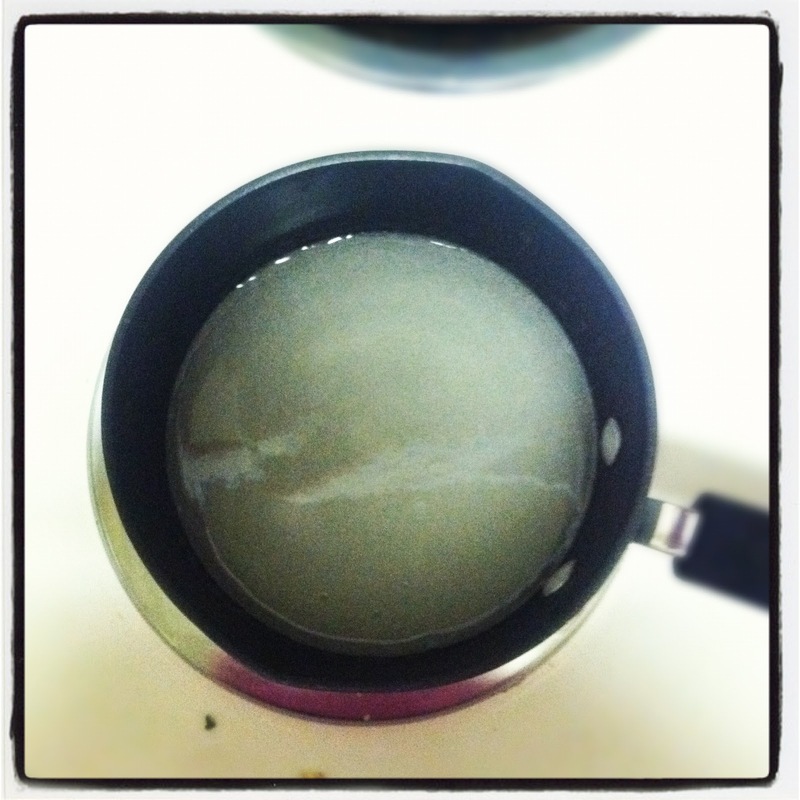 Add 2 packets of Sodium Alginate to 1 and 1/4 cups of warm water. Mix using an immersion blender, then pour into a saucepan. Bring to a rolling boil, let boil about 1 minute, then remove from heat and let cool for ten minutes. *Note, to clean my immersion blender (the alginate solution gets really sticky) I soak it in warm water and soap and change the water two or three times. 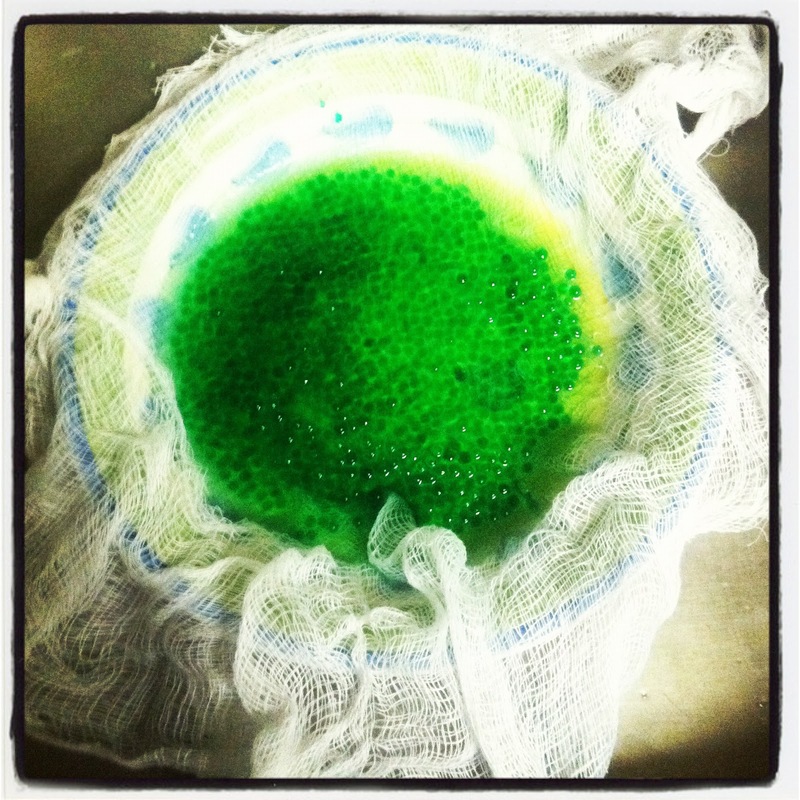 Mix together 1/3 cup alginate syrup and 1/3 cup creme de menthe. You will have leftover syrup – feel free to mix with other liquids (I think alcohol would be the safest bet) in a 1 to 1 ratio. However, I got REALLY sick of dropping in the small little balls, so keep that in mind. It takes forever. Add one packet Calcium Lactate to 4 cups lukewarm water. Mix thoroughly. Fill up a dropper with the mint mixture and dropper into the calcium bath. This takes a VERY long time! However, keep dropping them in until you have the amount of caviar that you want. Stir periodically or the caviar will get a weird little tail. I used a cheesecloth to separate the caviar from the water and this worked well. It you have a mesh strainer, this would also work. The holes in a slotted spoon were too large, so this would not work. *Note I used to think cheesecloth was intimidating – it sounds so fancy! Buy it. It costs like $2 and it is totally worth it. Step 6: Enjoy your awesome looking creation! I ate mine over chocolate ice cream. These would look cool over basically anything, and I also think they would look great in cocktails (mint in a mojito would be fantastic). You can pick these up and roll them between your fingers. 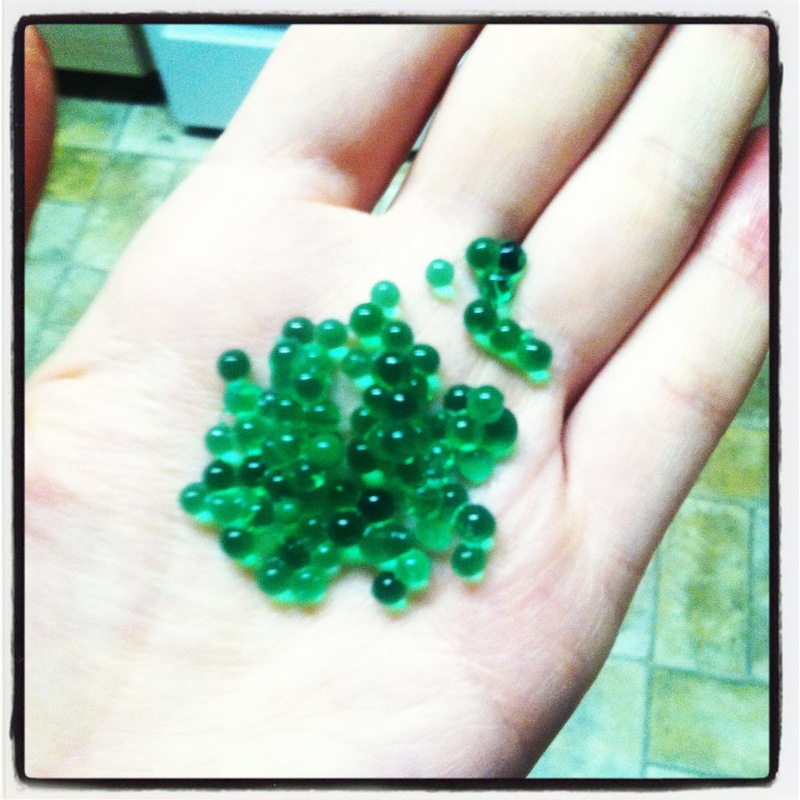 They are very sturdy little balls (they feel like small salmon eggs you use for fishing). Wow! I love the idea of using these in cocktails. I think these are the coolest looking ones thus far!